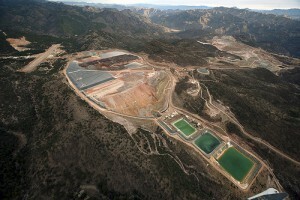 Alamos Gold’s 100%-owned Mulatos gold mine located 220 km east of Hermosillo, Sonora State, Mexico. Source: Alamos Gold Inc.
Alamos Gold Inc. [AGI-TSX, NYSE] said Wednesday April 3 that its Mulatos Mine in Mexico produced its two millionth ounce of gold in March 2019. This milestone marks the end of the 5% net smelter royalty, representing a saving of approximately $65 per ounce at the current gold price, the company said in a news release. Alamos Gold shares eased 1.67% or 11 cents to $6.48 on Wednesday and trade in a 52-week range of $3.88 and $7.97. Alamos is a Canadian-based intermediate gold producer with diversified production from four operating mines in North America, including the Young-Davidson and Island Gold mines in northern Ontario, and the Mulatos and El Chanate mines in Sonora Mexico. The company expects to produce between 480,000 and 520,000 ounces of gold this year, rising to 600,000 ounces in 2021. The expected increase in 2021 will reflect a full year of production from the Kirazli Project in Turkey. The Kirazli Project is located in Canakkale Province on the Biga Peninsula of northwestern Turkey. It is one of two 100%-owned Turkish projects that Alamos acquired from Teck Resources Ltd. [TECK.B-TSX; TECK-NYSE] and Fronteer Development for $90 million in January 2010. The other is the Agi Dagi Project, also located in Canakkale Province about 25 km from Kirazli. As outlined in a 2017 feasibility study, Kirazli has a 44% after-tax Internal Rate of Return and is expected to produce over 100,000 ounces of gold during its first full year of production at mine-site all-in sustaining costs of less than $400 an ounce. Meanwhile, Alamos said this past week marked the completion of a voluntary relocation of residents in the town of Mulatos to Matarchi which began in 2016. Alamos said it worked closely with the community during the relocation, investing in several projects that will provide long term benefits, including the construction of 21 new homes, as well as a new education centre, church and medical clinic. “The Mulatos operation has been an incredible success story,” said Alamos President and CEO John McCluskey. “It started producing gold in 2005 with approximately a seven-year mine life and 14 years later, the mine still has six years of reserves ahead of it,” he said. Mulatos is expected to produce 150,000 to 160,000 ounces of gold this year, a decrease from 175,500 ounces in 2018. Mine site all-in-sustaining costs are estimated at US$860-US$900 an ounce. The drop in the expected production at Mulatos is due to the fact in 2018, work crews achieved higher than expected recoveries at the La Yaqui and Multos areas. The company also achieved extended production from the high-grade San Carlos underground deposit, which reached the end of its mine life in the third quarter of 2018. Mulatos mine-site all-in sustaining costs are expected to decrease relative to 2018, a reduction that reflects the 5% net smelter royalty.